Loveland’s history has been defined by agriculture, which makes it a great place to find locally produced, made and raised products. When you’re looking for ways to improve your healthy eating habits, these local businesses, farms and ranches can certainly come in handy! And dining out is no different. We rounded up the local businesses that are serving Loveland healthier alternatives, showcasing local purveyors and focusing on healthy, sustainable ingredients. Enjoy! Blue Fin is a Northern Colorado favorite for sushi and Japanese cuisine. You can find this family-owned restaurant at The Promenade Shops at Centerra where they craft dishes using only the freshest ingredients available. Why it’s healthy: If you’re conscious of your choices, sushi can be very healthy because it’s packed with omega-3s, heart-healthy avocado, and other micronutrients found in fish and seafood. The Boar and Bull opened in downtown Loveland in 2014 as both a butcher shop and a tavern. Locally- and veteran-owned, the team sources some of the world’s best meats from no more than 100 miles away then crafts them into locally-famous pulled pork and brisket sandwiches, bacon, ribeye and more. Why it’s healthy: Though barbecue and meat-centric meals may not be your typical idea of healthy food, The Boar and Bull sources all of their meat from local farms and ranches. That means, when you are craving a meaty meal, their menu is healthier for both you and the environment. Cafe Athens is a locally-owned restaurant with two locations: one in Fort Collins and one at The Promenade Shops at Centerra in Loveland. Their menu showcases the best in Greek cuisine with American and Mediterranean flavors as well. That means they serve everything from burgers and fries to moussaka and hummus. Why it’s healthy: Greek food is known for its use of heart-healthy olive oil and typically uses lean meats and lots of veggies. To make the healthiest decisions, choose dishes like hummus, tabbouleh, Greek salad, the Chicken Platter, and keep in mind traditional gyro meat can be high in fat content. Crash Cuisine is Loveland’s local and entirely plant-based restaurant and bakery. They make their own, plant-based versions of meats and cheeses in-house using ingredients that have been minimally processed. And their other ingredients—like homemade pizza crusts—are made from scratch. Why it’s healthy: Meals that are made from scratch can cut out the majority of preservatives and other chemicals, and plant-based food can be better for both your body and the environment! That means, even when you order Crash Cuisine’s pizza, you’re choosing a healthier option than traditional pizzas. This locally-owned deli and sandwich shop serves toasted deli-style sandwiches, pizzas, hot soups, fresh salads and breakfast items. Their breads, which come in flavors and styles like sourdough, wheat, rye and jalapeno cheddar, are made from scratch daily, and their menu is available for both dine-in and carry-out. Why it’s healthy: Items made from scratch cut down on preservatives and other additives, so Daddy-O’s breads are already a healthier choice than other options. And the team’s salad menu is one of the best in town so you can load up on greens, veggies and other micro-nutrients. Door 222 is a favorite in Loveland for a variety of reasons. For starters, the menu is crafted with extensive detail in every bite. And, in addition to providing one of the freshest, seasonal menus in the region, this locally-owned spot gives back to the community. Each quarter, they donate a portion of specific menu items to local nonprofits in childhood enrichment and education, medical research, and animal shelter and enrichment. Why it’s healthy: The Door 222 menu showcases local, seasonal ingredients which can be both healthier and more sustainable than other options. They also offer one of the best salad menus in the area and their tapas menu can allow for multiple tastes of smaller portions. Taste Local is home to a scratch-made kitchen where they craft meals made with local, fresh ingredients sourced from local purveyors as often as possible. Even their drink menu features in-house and Colorado-made beverages! And because everything is made in-house—from the BBQ sauce to the whipped cream—their culinary team controls every ingredient. Why it’s healthy: Taste Local values sustainability and food which makes it the perfect option when searching for food that is healthy for your body, your environment and your community. Their menu features only scratch-made food and their ingredients highlight local growers and makers; you can see a list of those businesses here. The team at this local, health-conscious eatery skips shortcut ingredients like MSG and, instead, crafts meals the authentic, old-fashioned way. Using fresh ingredients and preparing everything from scratch, their menu showcases the bold flavors of Thai food and features some of our favorite meals in the region. Why it’s healthy: Authentic Thai food is famously one of the healthiest cuisines you can eat. Typical ingredients, including turmeric, ginger, lemongrass, coriander, coconut milk and others, have been proven to have multiple health benefits. When you choose meals lower in sugar and fat, you can have a delicious, healthy, local meal right here! Looking for more ways to eat healthier? 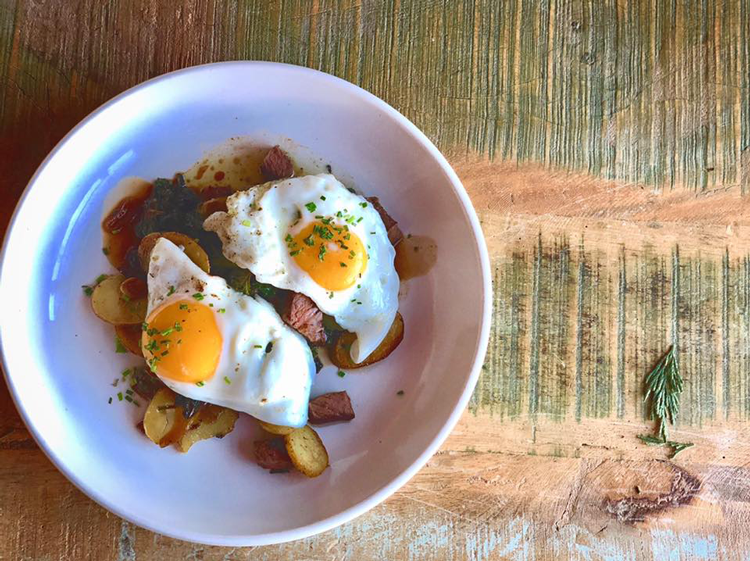 Check out our guide, Where to Buy Locally Raised Eggs and Meat in Northern Colorado, to find ways to support both your health and NoCo’s local businesses!